There’s about one week left of Dryuary, and if you’ve lasted this long, congratulations! Also, I feel you. I have been through every single LaCroix flavor on the grocery shelf, branching out into unfamiliar Bubly flavors like apple and strawberry. I have experimented with various juices and sucked on ice cubes at various bars. I even tried some N.A. elixirs that frankly, I found a little iffy: One billed itself as cucumber and lemon, which basically tasted like sour cucumber, which resembles a very specific, familiar flavor. Once I figured out I was basically drinking pickle juice, it was over. I tossed it. So this taste test of Fentimans craft sodas comes along at an advantageous time for me, just when I was begin to wail and gnash my teeth and regret the fact that I didn’t pick February for Dryuary this year, as it has the advantage of being three days shorter. Really, I don’t need much to be distracted: Hand me a fancy mocktail at a restaurant, jauntily decorated with a spring of rosemary or a basil leaf, and I nearly forget that I am painfully, 100-percent, stone-cold sober. At home is a different matter. I long for the sweet relief of chardonnay after an exceptionally trying round of homework help with the kids, or the umpteenth utterance of “Put down that Fortnite game right now.” Or, a nice beverage with my husband to finally get through those last three episodes of Homecoming. It takes a special sort of soft drink to bill itself as a relaxing treat after all that. Fortunately, somehow, Fentimans fits the bill. 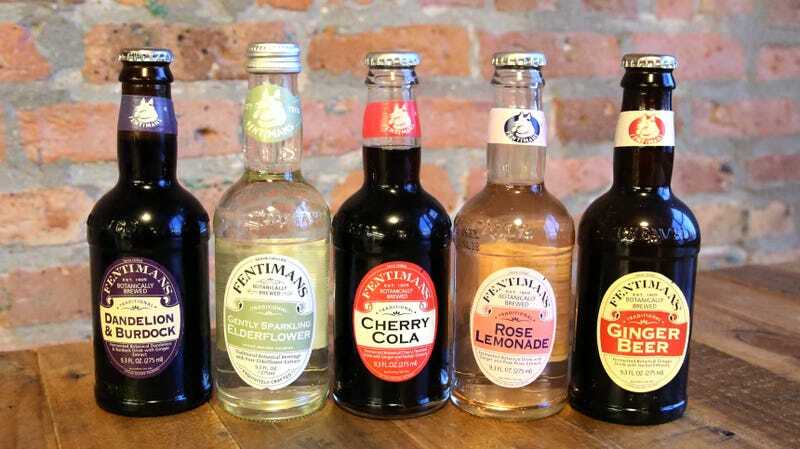 Fentimans, arguably, is the most high-profile of the bespoke soda purveyors. According to the its website, the historic botanical brewery started when Englishman Thomas Fentiman procured a recipe for ginger beer in 1905. He then started producing it and selling it door to door. Today the company instead sells the beverages on its website and in various stores, but the history remains: The company is run by Thomas Fentiman’s great-grandson, still utilizing the same botanical brewing techniques. Fortunately for those of us on the wagon, the company continues to make some amazing, next level, finely crafted soft drinks. They were like a beacon for me in this late January stage, offering me drinks so delicious I truly did not miss the alcohol. Well, some more than others. For this round I tasted five of Fentimans’ craft non-cocktails. Most were downright heavenly, but one fared even worse next to these ambrosia drinks. The website says that this concoction is “made with pure Rose oil from the world-famous Rose Valley in Kazanlak, Bulgaria and the juice of real lemons.” I just want to know where it’s been all my life, particularly during this trying month. This rose lemonade is light, refreshing, and fortunately not too sweet—a trait I found that most Fentimans beverages shared across the board, which I really appreciate. I admit to having a problem with perfume-y elements in edible things. I am not usually a fan of items like violet gum or lavender sorbet. It just feels like I’m eating soap. But the rose lemonade was so captivating—here the rose just added some intrigue with its floral aroma. I would buy a case of this stuff—and I just might, to get me through this final week. The Ginger Beer—the recipe whole company is based on—is the alpha to the omega that is Rose Lemonade. I usually love ginger ale, ginger beer, anything ginger-related. I love the spice and the feeling that on some level, the ginger is good for me. The website bills this concoction as “fiery and full of flavour.” I would instead describe it as too dark, too potent, too gritty, too much on its own. It might have worked as a mixer in a dark and stormy, or maybe cut with some lemonade. But straight-up solo, as I took every spicy “fiery” sip, I thought, “Why is this ginger beer mad at me?” Which would certainly lead me to avoid it in the future. Also in the light, refreshing lane is this Gently Sparking Elderflower beverage, which has a strong sour side that is somehow still refreshing thanks to the floral undertones (unlike that pickle juice). It offsets any bitterness with some beet sugar, ginger root, and a little pear extract. Second only to the rose lemonade in the heavenly beverage category. In the soft drink world, we are so inundated with cola brand leaders like Coca-Cola and Pepsi that it’s easy to forget that cola is actually a flavor on its own. And a mighty fine one, in fact, especially in the Fentimans’ cherry cola. Billed as “the world’s first botanically brewed cherry cola,” “the sweet tang of cherries” here helped boost this bottled cola to gourmet levels, with an appetizing hint of spice; I wish the ginger beer had taken things down a notch to this level. I would love to have this at the ready instead of those ubiquitous Coke Zero cans. Would also like to know what it tastes like with vanilla ice cream in it. This strange-sounding concoction is not some moonshine offshoot or something possibly offered to you by your local snake oil salesman. The website says that these “infusions of dandelion and burdock roots” help “create the unmistakable taste and aroma of this definitive classic.” Yes, that definitive classic mostly resembles root beer, but a sweet, unusual, more candy, less licorice-y take on it. Although all of these beverages had around the same amount of sugar (around 30 grams, except for Elderflower, which had 18), this concoction somehow tasted the sweetest. But as with all of the Fentimans beverages I tasted (with one outlier), I found it delicious enough to stand on its own mocktail legs as a fine beverage in its own right—no added spirits necessary.